The town of Grapevine is located just outside of Dallas along side Lake Grapevine. This lovely little town has a main street dotted with cafes , antique shops , restaurants and winery tasting rooms. Some of the wineries actually make the wine right there at their facility with "juice" brought in from California , New York and elsewhere. This was fine but we were looking for Estate grown Texas wine and we found it ! operating winery in the Red River Valley in North Texas. The Parker family has over 100 years of farming tradition that still continues today. The Vineyard was was planted with Cabernet Sauvignon and replaced the typical crop of wheat and corn. 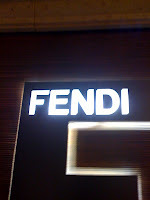 Denison Texas is known world wide especially the French. In 1880 Denison's T.V Munson helped save France's vineyards by sending thousands of North Texas grape rootstocks to the Charante region of France which were grafted to their native grape varieties to help make them disease resistant. To this day , Denison 's sister city is Cognac , France. When the Food and Wine trail begones us we go straight to the locals and find out where THEY go to dine. We headed east and visited the Dallas/Fort Worth area to see what was "cookin" in the Metroplex. 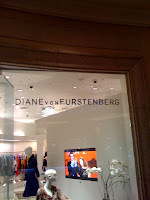 After speaking to many locals, the first thing we found out was that Dallas is not Just about Tex-Mex and BBQ anymore. Located in Downtown Dallas KENICHI came highly recommended by many young professionals we spoke with. 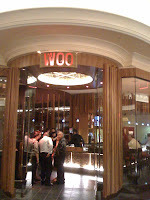 When we walked through the front doors we were reminded of many of the great Asian restaurants in Las Vegas and Miami. 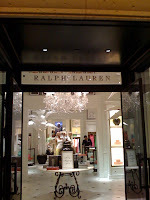 The decor was sleek and hip with the expected Asian twist. Master Sushi Chef Kiyomi Sano and Executive Chef Bodhi Durant have combined their talents to make KENICHI a local favorite of young hip professionals in Dallas with great Sushi , Sashimi , Tempura and rolls that are some of the best that we have had the pleasure to indulge in. Looking over the menu we were intrigued by the Ishiyaki method of cooking. A Japanese tradition that dates back to practically the beginning of time . Exquisite delights like Kobe Beef , Escolar , Scallop and Shiitike Mushrooms are placed on Hot Stone that is 1000 degrees and cooks these to perfection and very quickly. At KENISHI you have the option of getting just one of these dishes or choose the Chefs selection like we did so you can enjoy them all . We could not leave without trying a Roll. The most interesting Roll we found on the menu was the " Miami Roll "
ZEN : seeking to attain an intuitive illumination of mind and spirit through enlightenment. VINO LAS VEGAS reached a whole new level of culinary enlightenment when we visited ZINE at the Palazzo Resort in Las Vegas. From the time we walked through the door it was like being transported to Hong Kong and a new level of dining experience. Drawing from Cantonese, Taiwanese, Vietnamese, Szechuan and other Asian cooking styles, Chef Simon To has created a menu that’s tempting to both the casual and adventurous diner. ZINE in our opinion is the most authentic Asian restaurant on the Las Vegas Strip. Acclaimed Chef Simon To, recipient of the prestigious blue ribbon by the Le Cordon Bleu College of Culinary Arts and the genius behind the exclusive Paiza Club, melds traditional dishes with the extravagant in a comfortable, contemporary ambiance. ZINE does a fantastic job offering dishes that are not only for their large Asian clientele but for western tastes as well. From the Rare Filet Mignon Noodle Soup and Abalone and Chicken Congee to the Singapore-Style Pan-Fried Crab with Chili and Steamed Lobster in Garlic Sauce, every dish will transport you to one of the most acclaimed kitchens of Asia. On our visit to ZINE hosted by Ken Wong we had honor of dinning in one of their private dining rooms decorated with beautiful elegant china, a flat screen television and direct access to the baccarat room and lounge. Strawberry , Mango or Chocolate Ice Cream. If you are looking for a wonderful Chinese restaurant with reasonable prices , ZINE is the place to go in the Palazzo. You will be provided with outstanding service and delightful traditional Asian cuisine. To take a detailed look at ZINE and watch an in depth interview with General Manager Ken Wong please visit our premiere culinary site THE CUISINEIST. Sake and Sushi have had a marriage for probably thousands of years. We visited the Sushi and Sake club of Las Vegas and were in for a real treat. The group is combination of UNLV students (mostly beverage majors) and an off shoot formed from the local International Food Service Executives Assoc. 's called the wine club that started in May 2009. Even though they are currently called the wine club , there are plans to expand to include spirits and brewed beverages as well . The club meets once a month often on the UNLV campus . Green River sake is one of the highest quality sakes in Japan and is characterized by its fresh, complex, dry, clear finish and delicate flavor spectrum. For many years, sake brewers have not seriously practiced sake aging; however, they have found that appropriate aging is best for sake as well as sake lovers.Green River has two types of sake with different characteristics created through snow-aging and low temperature maturation. Green River Sake was on hand with several very nice Sakes from Niigata Japan. The Green River Snow Aged Rice Wine - Junmai Ginjo was the first one we tried. This very delicate Sake went well with the Sushi provide by Chef Wayne of Wayne' Sushi Bar. The Snow Aged rice wine was served cold and was smooth with a light elegant finish. Another Sake offered by Green River was the Select Oryza Rice wine- Junmai Ginjo . This was brewed with special NL 12 rice grown in Uonuma , Niigata Japan and had a lower alcohol content than previous Sake we have experienced. Because of its lower alcohol and smooth characteristics , the Oryza should most likely be paired with teriryaki and moderately flavored foods. We have spoken to many sommeleirs over the years and almost to a point, they agree that premium Sake should be served chilled. The Green River Five Seasons Sake-Junmai was brewed and aged at very low temperatures also from Uonuma, Niigata, Japan. This lovely Sake was well balanced with a spicy "bite" on the finish. Most any food can be paired with the Five Seasons because of its complexity. VINO LAS VEGAS sampled this Sake warm and chilled and found it to be delightful either way. We found a very special , fun Sushi Bar Located inside Shilla BBQ just West of Palace Station on Sahara Ave in Las Vegas. Wayne's Sushi and Karaoke Bar serves up Las Vegas's finest sushi with exciting dishes and unique atmosphere . Every dish is created using fresh ingredients made to order . Many of the items we found on our menu come from Wayne's Family recipes that can be found no where else other than in Las Vegas. With years of experience behind him Chef Wayne has created a fusion of traditional, and exotic flavors all mixed together in a unique atmosphere. And he is not a bad singer as well. Sake brewing is a natural process of the hydrolysis of starch in rice by Koji and yeast fermentation that takes place simultaneously in a vessel. Green River Sake adopts a traditional brewing with innovations, snow-aging and QC (quality control) program. This visit with the Sushi and Sake club was informative and attended by a wide variety of guests from UNLV students ,Professors and others in the Food and Beverage industry. For information on Green River Sake please visit http://www.greenriversake.com. If eating great Sushi in what we consider the most unique sushi bar in Las Vegas is an interest , visit http://www.waynessushi.com. for an inside look at Chef Wayne . 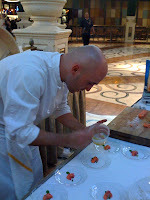 The Second Stroll, Swirl , Shop , Savor at the Venetian/Palazzo raised the bar from the previous event. With more wines and world class restaurants the " Vineyards of Style " is an event that is one to remember and for a good cause. 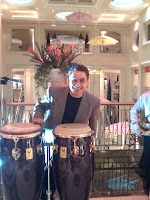 The stroll featured 7 wineries and 28 wines from across the country at The Shoppes at The Palazzo. All net proceeds from the event benefited Three Square the Las Vegas food bank that serves 250 agencies throughout Southern Nevada. 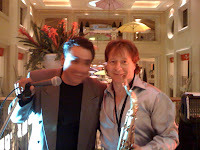 With The Shoppes at The Palazzo as the scene for the stylish event, guests tasted the wines and strolled throughout the luxurious shoppes enjoying live jazz music from local artist David Van Such and cuisine from ZINE, Restaurant Charlie and FIRST. We stopped into Double Helix Wine Bar + Boutique where they featured wines from the stroll and made them available for purchase . The wineries presenting at Vineyards of Style were a who's who from all over the country including Diageo Chateau & Estate Wines, Foster’s Wine Estates, Icon Estates, Lion Nathan USA, Rodney Strong Vineyards, Ste. Michelle Wine Estates and Southern Wine & Spirits Sake. The Palazzo, through The Venetian Foundation, donated all net proceeds of ticket sales to Three Square. 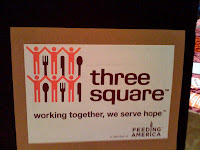 Three Square is the valley's food hub; a central location where donated and rescued food is collected and distributed to 250 agencies valley-wide. Three Square provides produce, dairy, non-perishable products, bakery items and ready-to-eat meals to non-profit and faith-based organizations. With their mission to provide wholesome food to hungry people, while passionately pursuing a hunger free community, Three Square is a place for community members to meet, serve and collaborate as part of the food solution. 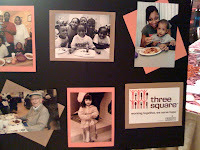 For additional information on Three Square please visit www.threesquare.org. 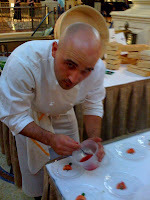 This event has set the standard for a different way to enjoy great food and wine. 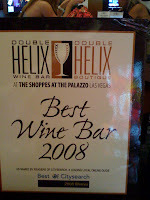 Look for future quarterly wine strolls at The Palazzo coming in August and October, 2009. Become a fan of The Venetian Las Vegas or The Palazzo Las Vegas Facebook Fan pages and you'll receive a $5 discount on tickets. To redeem your discount, visit the events section of either Facebook page for the promotion code to enter when you go to purchase tickets online. As a fan of either property, you’ll be immediately updated on current events, property promotions, celebrity sightings and more! If up to the minute updates is what you crave, follow them on Twitter at twitter.com/venetianveagas and twitter.com/palazzolasvegas.